This past weekend was spent in Chicago with my family, celebrating my oldest nephew’s graduation from US Navy boot camp. Since he only had about 36 hours to be away from base, before shipping off to the next part of his training, we wanted to make sure he had a chance to eat whatever he wanted, and do whatever he wanted. I told him that I would make him any kind of cupcakes that he wanted for Saturday’s dinner; his only request was that they be chocolate. 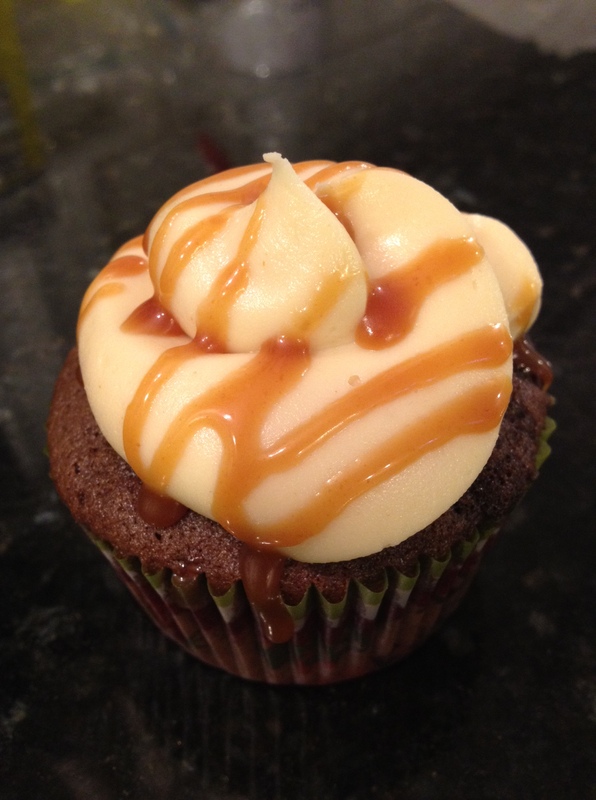 So, I set out to make a light, airy, moist chocolate cupcake – and figured that, rather than make the cupcakes giant chocolate bombs, I’d do something a little different with the frosting: salted caramel buttercream. I keep meaning to make this buttercream for all kinds of occasions, and have just never gotten around to it. Let’s just say I’m glad I finally sat down and figured out a good recipe, because I’m planning to use this stuff on EVERYTHING. 1.) Preheat your oven to 350°. In a small bowl, whisk together your cocoa powder and hot water until the mixture is smooth. Set the mixture aside. 2.) In another bowl, place your butter and sugar. Microwave the two in 30-second increments, stirring after each, until the butter is totally melted. Place the butter and sugar mixture into the bowl of a stand mixer (or just a mixing bowl), and beat on medium-low (with the paddle attachment, or a hand mixer) for 4-5 minutes, or until the mixture is cool to the touch. 3.) Add your eggs in, one at a time, beating until each one is fully combined. Add your vanilla and cocoa/water mixture, and mix well. Add your baking soda and salt, and beat until those are fully incorporated as well. 4.) Add 1/3 of your flour, mixing until just combined; then half your sour cream, another third of your flour, the rest of your sour cream, and the rest of your flour. Be careful not to overmix after each addition! 5.) Line your cupcake tins with paper liners. Fill them about 2/3 full (I like to use a 4T scoop for this). Bake for 15-18 minutes, or until a toothpick inserted into the center of one of the cupcakes comes out clean. 6.) While your cupcakes are baking, make your frosting. Cream together your butter, sugar, and caramel sauce – I’d start with 2 1/2 to 3 cups of powdered sugar, and add more if needed. 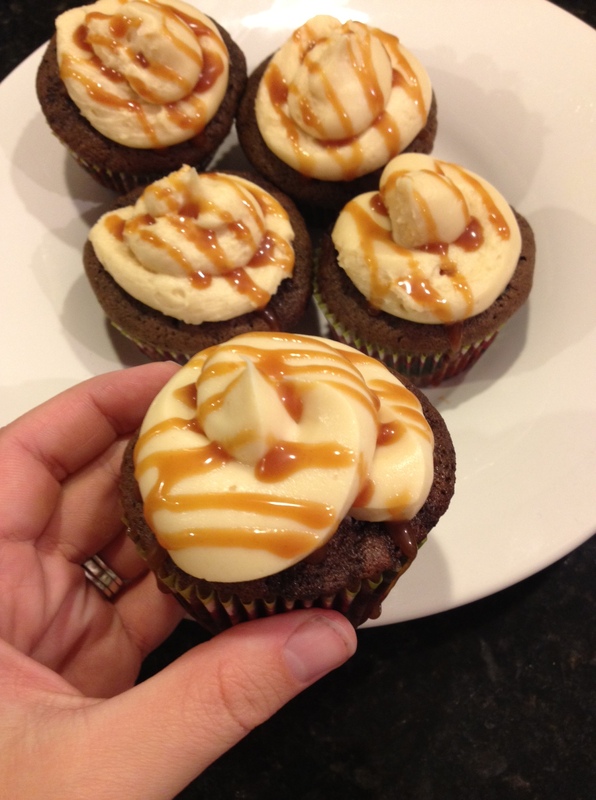 If you do NOT want to drizzle caramel on the top of your cupcakes, you might want to add a bit more salted caramel sauce to your frosting, to make sure the flavor really comes through. 7.) When your cupcakes are fully cooled (give them at least an hour), frost them with the salted caramel buttercream, and drizzle with additional caramel. *This frosting recipe makes enough to pipe the cupcakes with frosting (I just used a gallon-size ziploc, as I was caught without my frosting tips and pastry bags – THE HORROR!). If you are simply going to spread the frosting on with a knife, you could probably cut the recipe back by as much as half. These cupcakes were DAMN good, if I’m being honest. They are rich, to be sure – but the light and airy texture of the cupcake keeps them from being overwhelmingly heavy. If you are a fan of the sweet/salty flavor combination, these will be right up your alley! 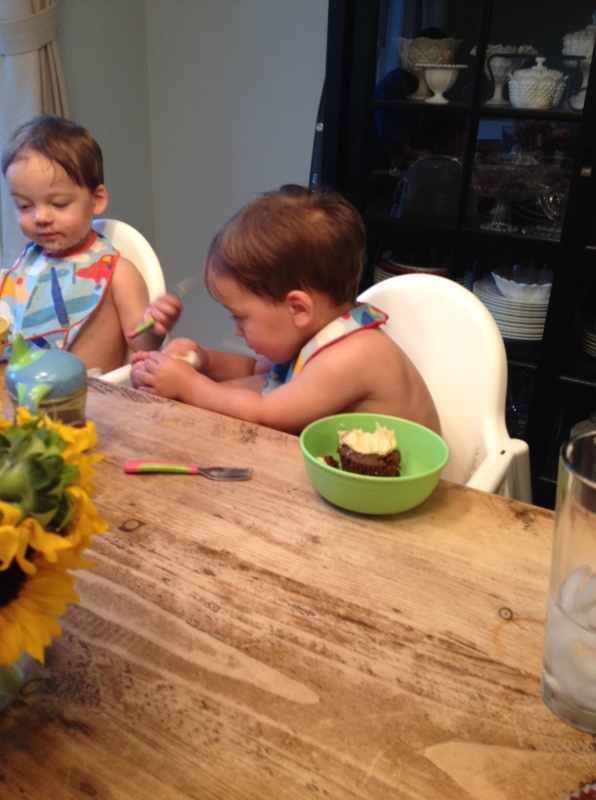 Please note that these cupcakes have been approved by babies everywhere. However, be warned that a.) the pesky frosting might accidentally get on your feet, resulting in the need for a mid-snack wipe down, and b.) 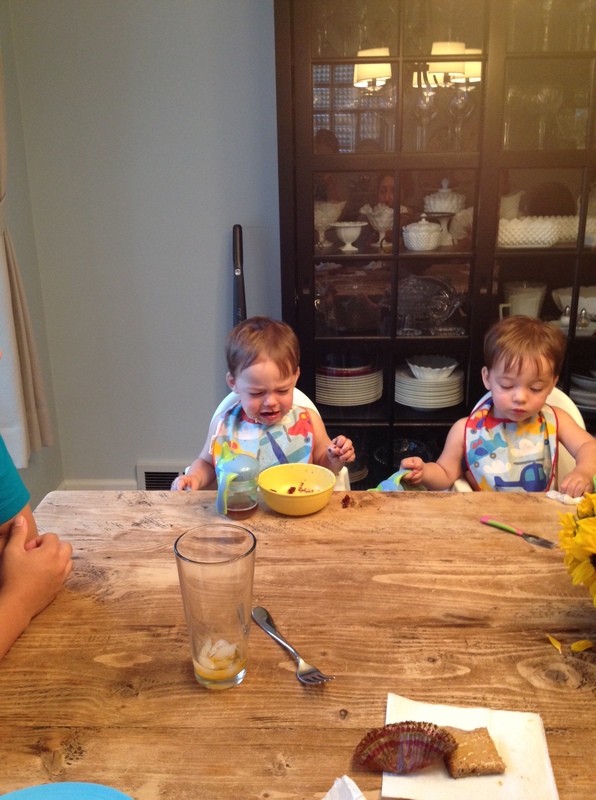 the realization that there is no cupcake left in your bowl has the potential to cause spontaneous bouts of crying. i expect you’ll get off the plane carrying some for us? These sound like a good option for breakfast?